Johann Bayer originally named this constellation Apis (the bee). Edmond Halley called it Musca Apis (the fly-bee). Nicolas-Louis de Lacaille named it Musca Australis (the southern fly). Halley was born November 8, 1656 in Haggerston, Shoreditch, near London. He was a mathematician and astronomer who made great contributions to the scientific revolution of his day. Halley was 4 when Charles II reestablished the monarchy in England. He also chartered an organization that people soon called the Royal Society of London. Halley entered Queen's College in 1673, and was introduced to John Flamsteed, who became the Astronomer Royal three years later. Flamsteed also encouraged Halley to study astronomy. Flamsteed had the radical idea of using a telescope to produce a catalog of northern stars. Tycho's catalog	had been done without optical aid. Halley decided to compile a southern star catalog to augment Flamsteed's efforts. After two years of bad weather on St. Helena, he had observed a transit of Mercury, and cataloged 341 stars. This work earned him admission into the Royal Society in 1678. On returning home, he and Robert Hooke attempted to solve the mechanics of planetary motion. Halley suspected that the force that kept the planets in orbit obeyed the inverse square law, but could not make his calculations work. A visit to Isaac Newton proved a watershed for science. Newton said he had solved all the equations, but had lost his calculations (this may not be quite true, for Newton seemed deathly afraid to publish at times). With Halley's encouragement, Newton developed his work into the famous Philosophiae Naturalis Principia Mathematica, perhaps the greatest scientific work ever written. Halley also tried to settle a nasty dispute between Newton and Hooke over charges of intellectual theft, and saw the Principia through publication. In short, Halley displayed considerable diplomatic skills, and proved to be a good editor, as well as a good scientist. Halley also did considerable work on his own. His most famous work was A Synopsis of the Astronomy of Comets, published in 1705. In it, he argues that the comets of 1531, 1607, and 1682 were probably the same body, and he predicted it would return in 1758. When it, in fact, did return on schedule, it recieved Halley's name. Halley, himself, became Astronomer Royal in 1720, and died on January 14, 1742. 152k JPEG NGC5189 (Bennett 62) is a fairly bright (mag. 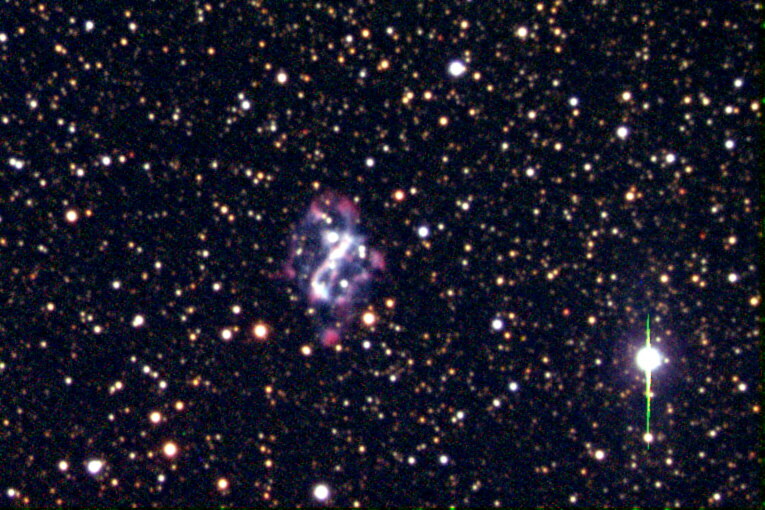 10), small (2.6'), irregular planetary nebula in north-east Musca near Centaurus. Visually, it looks a little like a barred spiral. It's true nature revealed by this image. Image taken by Peter J. Ward, Sydney Australia. C11 at F6.3, Losmandy GM100 mounting. 69k JPEG NGC4833 (Bennett 56, Caldwell 105) is a globular cluster described as bright (mag. 7.4, large (13.5'), round, strongly condensed, with stars at mag. 12 and fainter. It sits .7° NNW of Delta Muscae. From the Digital Sky Survey. 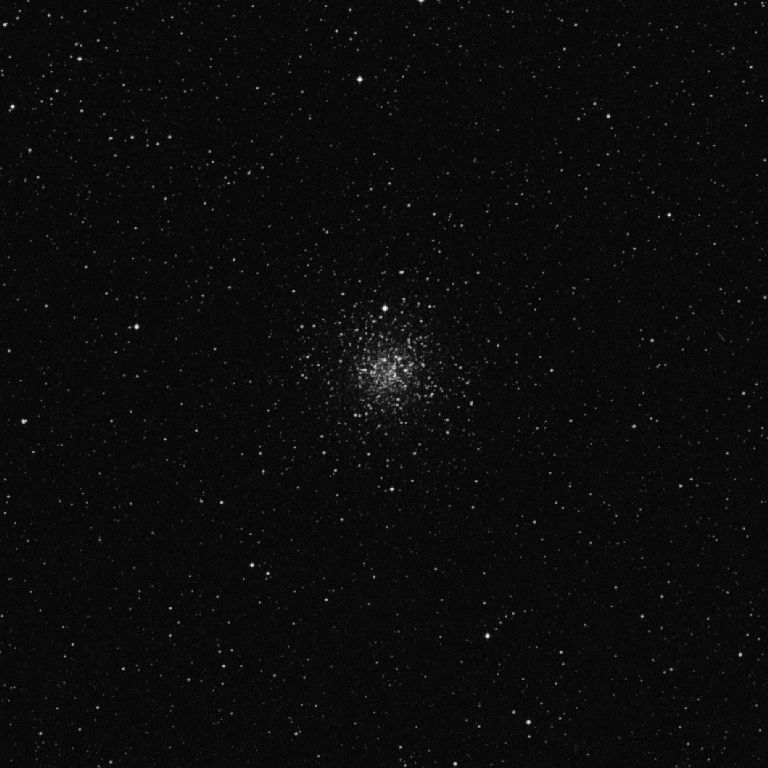 61k JPEG NGC4372 (Bennett 50, Caldwell 108) is another globular cluster described as fairly faint (mag. 7.8, large (18.6'), round, with stars from mag. 12-16. 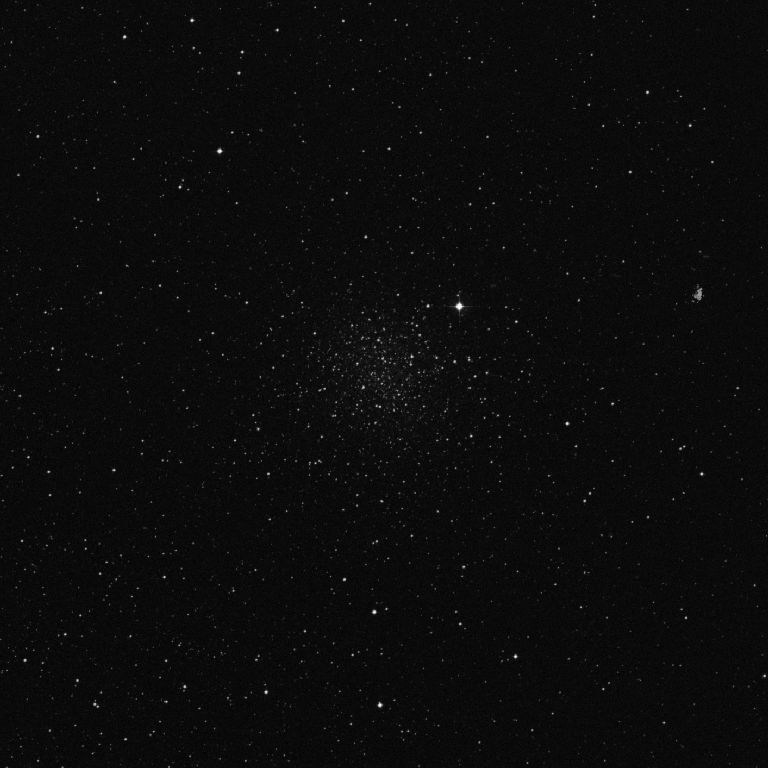 It lies .7° SW of Gamma Muscae. From the Digital Sky Survey.